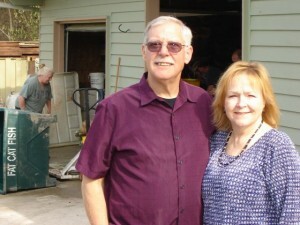 Paul Shorb and his wife, Rose, first began handing out food from the back of his pickup truck after church in 2008. After Sunday morning services at his church in Lacey back in 2008, Paul Shorb would quickly head for the parking lot, ready to hand out food from the back of his pickup truck. And maybe about five people would take something. Fast forward six years. From those helpful but modest beginnings, Shorb’s “food truck” has grown into a world-wide outreach that fed about 280,000 people last year. Fittingly, his outreach, which includes three food banks and a partnership with 26 local churches and Youth With A Mission, is called Faith Harvest Helpers. While the scope of his outreach is wider than he ever dreamed it would be, the mission hasn’t changed. Shorb has a small army of volunteers partnering with him, helping feed the hungry. He figured about 642 volunteers helped Faith Harvest Helpers last year, doing everything from picking up day-old food from major grocery distribution centers, to delivering food to churches or food banks to working at a food bank and putting food on the shelves. Then there’s the fresh salmon he gets. A couple times a week, during certain times of the year, Shorb has a crew fillet and can hundreds of pounds of salmon that’s been donated by the state’s Department of Fish and Wildlife or Nisqually Tribe. With the help of volunteers and a dozen pressure cookers, Faith Harvest Helpers canned about 60,000 pounds of salmon last year. 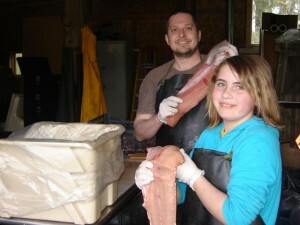 Volunteers fillet and can about 60,000 pounds of salmon. Volunteers at Faith Harvest Helpers come in all different shapes and ages. There’s the teen helping stock shelves at one of the food banks in Yelm, Lacey or in Redmond, Ore. Then there’s the gray-haired senior, filleting salmon or driving a truck loaded with food. “It’s all about being willing to help,” Shorb said. Shorb always carries two bags of potato chips in his car. When he sees a guy on the corner who is hungry, he gives him a bag of chips. He said food is a way of sharing and caring. Sometimes, he’s been surprised when that opportunity to share comes. The woman, who Shorb knew at church at Faith Assembly in Lacey, didn’t have enough money to buy the food she needed. More than 640 volunteers assisted Shorb last year with his food bank. At a coffee shop, Shorb got another unexpected opportunity to help. Shorb had a box of doughnuts that Starbucks had donated to him. A homeless man asked if he could have a doughnut. He took an apple fritter and ate it slowly. Then he asked for another. Faith Harvest Helpers is an outreach that meets two needs – physical and spiritual hunger. It ships food and supplies in 40,000 pound containers to those in dire need in Guatemala, in this country and worldwide. Both Paul and Rose Shorb have completed a Youth With A Mission discipleship training and plan on opening an agriculturally based YWAM center on 44 acres near Yelm. For more information, go to their website.